If you want to achieve the best results possible on your next painting project, use a primer. Are you a do-it-yourselfer who has a paint project coming up? Have you have already taken a trip to your local hardware/paint store and picked up all the necessary painting supplies? This probably includes things like gallons of paint, paint rollers, painter’s tape, drop cloths, and paint brushes. One thing that people frequently neglect to buy is a primer. Many people are under the misconception that applying primer is a waste of time and money. This couldn’t be further from the truth! With that said, here are some of the benefits of using a primer. To put it simply, a primer will provide you with better color. 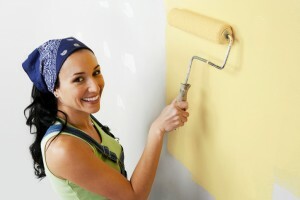 If you want your new paint colors to be vibrant, you must prime the surface first. This is because a primer will hide the previous color of the wall. If you are using a high-quality primer, it will be able to cover up the previous color entirely. For example, let’s say that you are trying to paint over a bright red with a standard eggshell white. If you don’t apply a primer, the red is likely going to bleed through. A gallon or two of primer is worth the investment because it will ultimately save you time and money. This is because priming seals the walls. By doing so, you won’t need to use nearly as much paint to get the job done. Most people don’t realize that a gallon of primer is less expensive than a gallon of paint. Using a primer before you begin painting will provide you with a better overall product. Also, a primer will help prevent the paint from cracking and peeling down the line. On top of that, it will help the paint retain its color over time. Did you know that most stains are going to bleed right through a coat of paint? By not applying a primer, you are taking the risk that ugly water stain in your kitchen will be covered up with just a coat of paint. If you want to ensure your painting project doesn’t get ruined, use a primer for safe measure.